This section describes how to create a new C++ system using command capturing files. 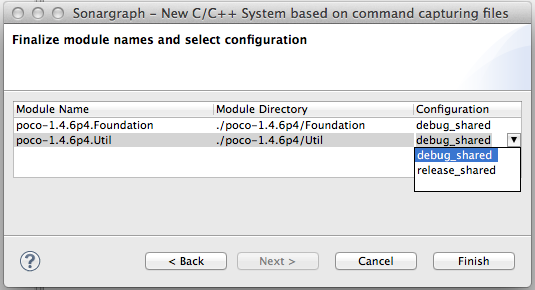 Select "New" → "System based on C/C++ Make command capturing files" . Specify the name of the directory of the Sonargraph software system and where its files will be stored. It is a best practice to store the software system close to the actual source code and place it under version control. Using a Quality Model is explained in Section 2.6, “Share Results” ; you can leave this option unchecked for now. After executing those commands you should find 'h2m-capture.txt' files in the relevant project directories; 'make clean' can be replaced with another command you use to force a complete rebuild of your system. On Windows platforms the capturing process currently only works in combination with Cygwin. 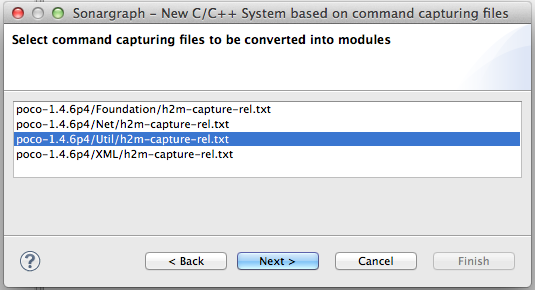 Once the 'h2m-capture.txt' files have been generated you can choose which of them you want to use to create the modules. If you want, you can change the name and configuration for each of the modules by editing the corresponding fields. Each generated 'h2m-capture.txt' results in the creation of one module in the Sonargraph workspace. You can see the created modules in the Navigation view. The next step to get started with your analysis is perform a refresh so the required information is picked up from the set-up modules.